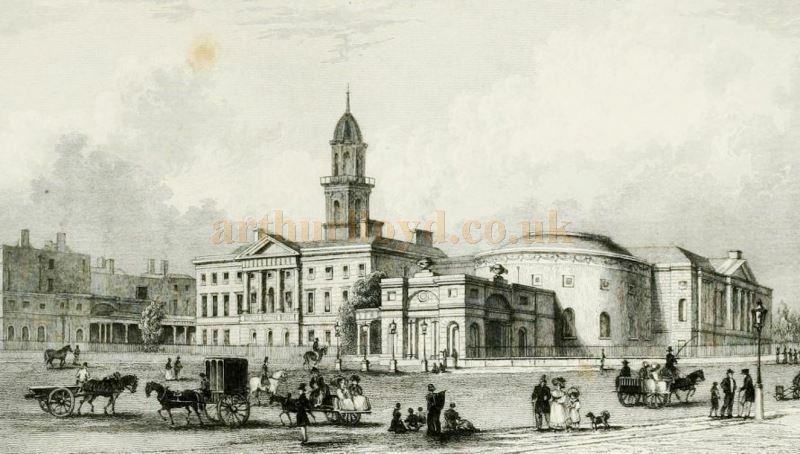 Above - An Engraving showing the Rotunda Hospital and Concert Hall - From 'Ireland Illustrated' by George Newenham Wright. The Round Room at the Rotundo was one of Dublin's earliest Concert and Music Halls and was situated within the Rotunda Maternity Hospital built by Bartholomew Mosse in 1757. Funds for the building of the Hospital were gained by organising Concerts and Garden visits, and by renting out Sedan Chairs to locals, an early form of the Taxis services we know today. The Rotunda Concert Hall, was referred to often in contemporary reports as 'the Round Room at the Rotundo', Rotunda actually means 'Round Room'. Arthur Lloyd and his family are known to have performed here on numerous occasions, see reviews and advertisements on this page, the earliest being from 1866. The main Hospital building was designed by Richard Cassells, but John Ensor designed the Round Room itself, and James Gandon designed the Square Entrance Building which is situated on the corner of the building even today. The Round Room became a very popular place for early Music Hall and Concert Performances, and would later be used to show very early 'Moving Pictures' in the 1890s, this was so popular that by 1910 the Room was being used as a full time Cinema. In the 1950s the Cinema was redesigned with a Balcony and Boxes and could accommodate 1,200 people, and in 1954 it was renamed the Ambassador Cinema. It ran as such until it was finally closed as a Cinema in 1999, and today it's in use for various events under the name of the Ambassador Events Centre. The former Supper Rooms are in use today as the Gate Theatre, and the former Pillar Room is in use for conferences and other events. The rest of the building is still in use as a Maternity Hospital, the oldest surviving Maternity Hospital in the world. In Philip B. Ryan's book 'The Lost Theatres Of Dublin' by Philip B Ryan. he includes the following passage which mentions the Rotundo, in relation to other Dublin Theatres, saying:- 'In 1897, the year in which Dan Lowrey's Music Hall (which had opened as The Star of Erin) was renamed the Empire Palace, there was no opposition from radio or cinema. The Gaiety and the Theatre Royal were not in direct competition as they presented straight plays which included Shakespeare, old classical comedies and grand opera which alternated with musical comedy. 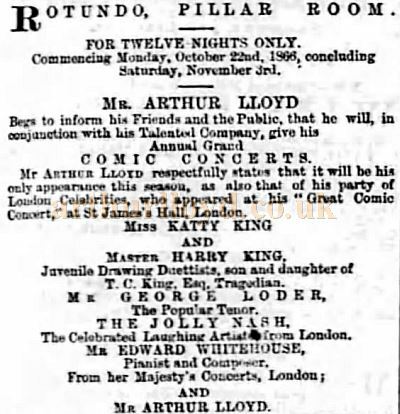 Left - An Advertisement for Arthur Lloyd's Comic Concert at the Rotundo, Pillar Room - From the Irish Times of October the 20th 1866. The Queen's Royal Theatre delighted its audiences with an endless diet of melodrama and nationalist historical plays. All three Theatres presented a Christmas pantomime or Harlequinade (Harlequin's and the Clown's contribution became much reduced with the passage of time until eventually they disappeared entirely). The Round Room at the Rotundo specialised in concerts and musical evenings.' - An edited passage from the detailed book: 'The Lost Theatres Of Dublin' by Philip B Ryan. 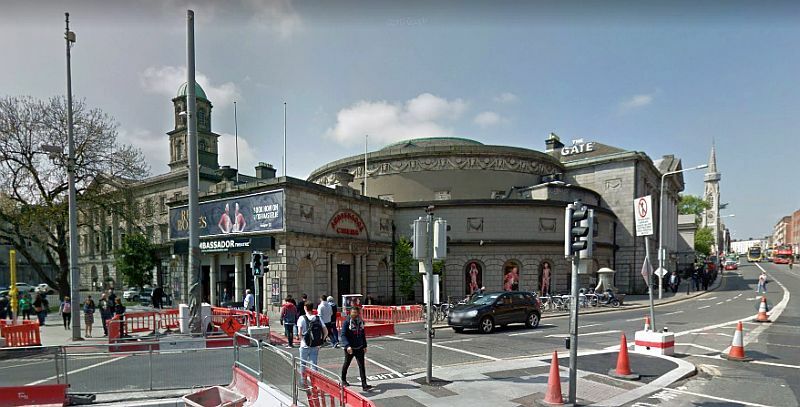 Above - A Google StreetView Image showing the Rotunda Maternity Hospital and former Rotunda Concert Room - Click to Interact. Today the Gate Theatre and former Ambassador Cinema, now the Ambassador Events Centre, are also situated within the building. 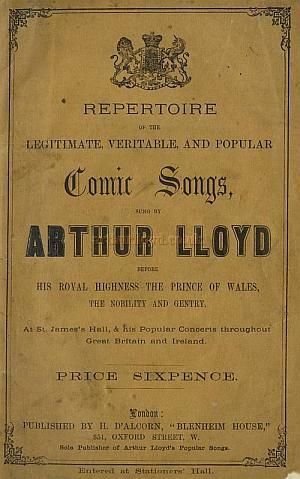 Mr. Arthur Lloyd's Comic Concerts. - The first of two concerts announced by Mr. Arthur Lloyd came off last evening in the Round Room of the Rotundo, and since the time of Jullien, we do not remember to have seen so crowded and fashionable an audience in it as assembled on Saturday evening. The reserved seats, balconies, and promenade were packed full by ladies and gentlemen, attracted by the very high reputation which preceded the persons who were able to take part in the entertainment. We are happy in being able to say that they fully succeeded in making a capital first impression on a Dublin audience, and in justifying all that has been spoken and written of their performances in other places, and we have seldom "sat out an evening" more pleasantly than on the occasion when Mr. Lloyd and his associates made their debut at the Rotundo. The performances, which were of a very varied character, opened with Mr. A. Lloyd singing the very clever comic song of "The Swell" which he gave admirable pantomimic effect. He was enthusiastically applauded and encored. Right - The front cover of the Arthur Lloyd Song Book which this review was printed in - Click for more information. Speaking of encores, we might as well here remark that every song given during the evening was re-demanded. This is a great bore to the performers as well as to the great majority of a respectable audience, and the sooner it is put down the better. An occasional encore being complied with is nothing more than fair, but to repeat every song in the programme is too much of a good thing. Musicians, no matter whether they may be vocalists or instrumentalists, should be firm in resisting noisy demands for repetitions, and encores should not be given unless the desire for it was beyond doubt expressed by the great majority of those present, In the medley of "The Song of Songs," Mr. Lloyd's "make up" and style were "immense," and produced any amount of merriment. It is needless to say that he had to sing it a second time. And Mr. Lloyd's rendering of the comic song of "The Ballet Girl," was one of the best things in the serio-comic vain that we have heard. We have not space at our disposal to go into further details of last night's entertainment, which was one of the most attractive things of the kind that has been produced here for a long time. Text from Dublin Freeman's Journal, printed in an Arthur Lloyd Song Book. - Click here for more information. Mr. Arthur Lloyd deservedly has been, and will continue to be a favourite with the amusement-seeking public of Dublin. The great popularity he has attained in England for his many admirable comic songs has extended itself in an equal degree to this country, and the name of Lloyd alone is sufficient to fill the largest room used for concerts in the City. This was fully exemplified last evening when, notwithstanding the rival attractions of the Italian Operas, a new star at the Queen's and the inducements held forth for a visit to the Exhibition building, Mr. Lloyd had to congratulate himself on having almost crowded the Round Room of the Rotundo. Successful as he has been here on former occasions there appears to be little doubt but that success will be in a great degree augmented during his present visit. The "two hours fun" which he provides is varied in its nature and pleasing in its arrangement. The troupe which accompanies Mr. Lloyd is exceedingly clever and very talented. Some comic sketches are very happily brought out; Mr. W. B. Alexander is an excellent ventriloquist, and delights the audience by some amusing incidents, in which he shows much ability in his profession. Mr. R. Lloyd also performs his part well, and Miss Minnie Lloyd and Miss Lizzie Nelson are very well received. As regards Mr. Arthur Lloyd, his appearance last night was hailed with loud applause, and the inimitable manner in which he rendered some of the most favourite comic songs provoked several encores. He was especially good in his new song, "Not for Joseph," sung for the first time in Dublin, which was enthusiastically re-demanded. The stage, which was very prettily arranged, reflected much credit on Mr. Dillon. Mr. Lloyd's concerts will continue in the Rotundo this evening and to-morrow. Text from the Irish Times of 1867 - Kindly sent in by David O'Connor, the Great, Great, Grandson of Mr James Dillon, manager of the Rotundo at the time. If one is melancholy and suffering in the least degree from ennui, a remedy can be found by spending an hour or two with Mr. Arthur Lloyd, in the Round Room of the Rotundo. Many persons from time to time have visited the City and given public concerts of a comic character, not sentimental concerts which became comic from painful failures on the part of the vocalists, but concerts devoted exclusively to songs of an amusing character. Some have had merit and others sadly failed indeed, arising from the fact that it is most difficult to get a good comic singer as to find a really good tenor for the Italian Opera, so that when Giuglini or Ifungini appear, persons crowd to hear them. On the same principle people go to hear a comic singer who is unrivaled, and such is Mr. Arthur Lloyd. He no sooner sings than mirth seizes upon the audience - young and old - and holds them captive until the vocalist makes a parting bow. His programme last evening was varied and indeed amusing. The songs are his own composition, and he has given them names characteristic of their gaiety. Mr. Lloyd's appearance at present in Dublin, we believe is due to Mr. Dillon, who seems to be ever on the qui eire for some new attraction to amuse people and arouse them from depressing influences of this work-day world. Mr. Lloyd's song, "Beautiful for ever," in memory of Madame Rachel, was one of the best items in the programme last evening. The concert was diversified by other amusing entertainments. Text from the Irish Times of 1868 - Kindly sent in by David O'Connor, the Great, Great, Grandson of Mr James Dillon, manager of the Rotundo at the time. Mrs. Arthur Lloyd (late Miss Katty King) has appeared in different places with Mr. A Lloyd in a comic entertainment with great success, and her charming manners have at once secured for her the attention of large fashionable audiences. During the sketch Mrs. Lloyd sings "Barney O' Hea" with great sweetness and animation. Mrs Lloyd, we are pleased to observe, will appear next Monday evening at the Rotundo, and we have no doubt that she will receive a hearty welcome from the crowds who always flock to "Two Hours' Genuine Fun" with Arthur Lloyd and his comic company. Mr. Dillon has promised a most interesting entertainment for next week, and when he makes a promise we may fairly say he keeps it. Above text from the Irish Times of 1871 - Kindly sent in by David O'Connor, the Great, Great, Grandson of Mr James Dillon, manager of the Rotundo at the time. 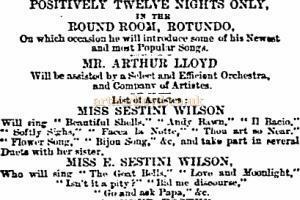 Above - The Misses Sestini Wilson and Mr Mozart Wilson, now with Mr Arthur Lloyd, in his world-wide celebrated Entertainment, entitled Two Hours' Genuine Fun, continue to be received with the most cordial expressions of approval from fashionable and crowded audiences at the Round Room, Rotundo, Dublin. Engaged till the end of March with Mr Lloyd. Proprietors and Managers wishing to engage them must apply at once - The Era 1st Jan 1871. Above - Mr. Fred Foster, now with Mr. Arthur Lloyd at the Round Room, Rotundo, Dublin, has been received with acclamations of delight in all his impersonations, and in his celebrated medley, entitled "TheGirl of the Period," completely took the audience by storm, and established himself on this, his first appearance in Dublin, as a firm favourite in the estimation of his Hibernian friends. The Press of Dublin speak in the highest terms of his versatillity and talent. F. F. Returns to London at Easter, with new songs by the best Authors and Composers - The Era 1st Jan 1871. Mr. Arthur Lloyd - Last evening Mr. Arthur Lloyd and his comic concert company appeared in the Round Room, Rotundo, under the auspices of Mr James Dillon. The arrangements made for the entree of this very popular troupe reflected great credit upon the management. Right - An Advertisement for Arthur Lloyd at the Round Room at the Rotundo, Dublin in 1870. The stage was arranged upon the model of a boudoir - canopied, tapestried, and elegantly upholstered. It was really cheering to witness the good taste displayed in this department, and to turn attention to the exquisite sense of appropriate ornamentation which the lessee has exhibited in the furnishing of his stalls by the introduction of fauticuls and fancy chairs. But the entertainment which Mr Lloyd produced was - detracted from mere adventitious surroundings - well deserving of patronage and support. With the coarse imbroglio garnishing the fare presented to coarse palates in many of the Cafos Chantant of Paris, with the mots a double entendre, which too frequently offend all sense of propriety at London music halls, and with the still more vicious system of presenting obscene songs, Mr Arthur Lloyd has no connection. Query, could an entertainment of an essentially comic character be found more pure: it is possible to realize one in which the lowliest as well as the most cultivated can enjoy a couple hours "genuine fun?" It is no flattery of Mr Lloyd to say that indecency finds no place in his entertainment, for, from the beginning to end the greatest purist can find nothing to make complaint of. A principle feature of the new entertainment is a charming little sketch entitled "Dolly Varden," in which Mr and Mrs Lloyd appear. The morceau is to some extent a burlesque upon Mr Gilbert's beautiful comedy of "Pygmalion and Galatea," but it has distinctive features which makes it a novelty, and bring into prominence the characteristics of the executants. It may be mentioned that Mr Lloyd's voice is as full and rotund as of old, and that of his esteemed partner (the daughter of the Dublin Favourite, T C King), is clear and resonant, and equal to any demand made upon the organ. In addition to participation in this comic sketch, Mr Lloyd sang a number of his world-renowned songs, highly mirth-provoking and enlivening to a genial entertainment. When it is added that Mr Frank Mordaunt, a really clever ventriloquist; Miss Nelly Dyoll, a pretty fair vocalist; and Mr H. F. Lloyd, the only bona fide successor of the late Mr Sam Cowell, contributed to the entertainment, and that Mr Mozart Wilson is pianist, an idea may be formed of an entertainment which is intrinsically good and meritorious. Text from the Irish Times of 1872 - Kindly sent in by David O'Connor, the Great, Great, Grandson of Mr James Dillon, manager of the Rotundo at the time, and a Theatrical Agent, Printer, Bill poster and Advertising Agent. He also printed and posted extensive posters around Dublin. Archive newspaper reports on this page were collated and kindly sent in for inclusion by B.F.